Here it is… our year end look at upcoming events in a sky near you. This is not a top 10 listicle, and not a full-fledged almanac, but hopefully, something special and unique in between. And as always, some of the events listed will be seen by a large swath of humanity, while others grace the hinterlands and may well go unrecorded by human eyes. We'll explain our reasoning for drilling down each category, and give a handy list of resources at the end. Comet C/2013 US10 Catalina continues to perform as a binocular comet through January. 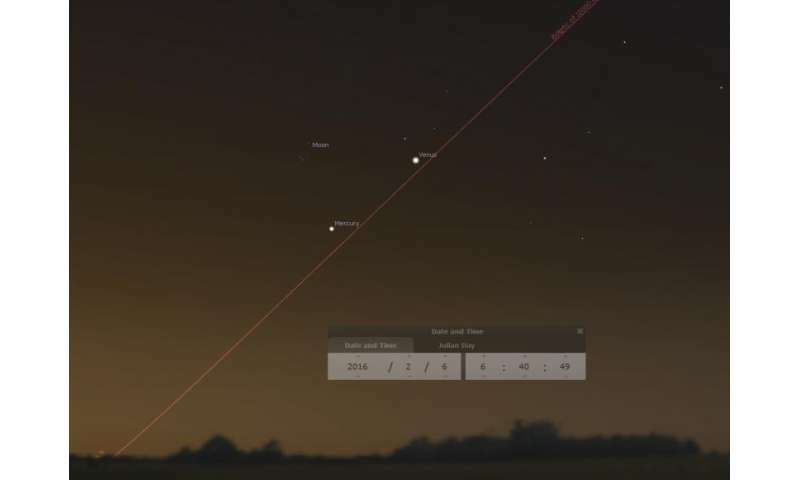 Mars reaches opposition on May 22nd. Mercury transits the Sun on May 9th, the first time it has done so since 2006. A close grouping of Venus and Jupiter on August 27th. A total solar eclipse of the Sun crossing southeast Asia on March 9th. A fine series of occultations of the bright star Aldebaran by the Moon continues, including a fine nighttime event on January 20th for North America. An annular solar eclipse across central Africa on September 1st. No dawn or dusk elongations of the planet Venus occur in 2016. The last time Venus experienced an 'elongationless year' was 2008, and the next is 2024, right in step with the 8-year cycle of Venus. 2016 also sees the Sun coming off of the maximum for solar cycle #24, and its anyone's guess as to whether we'll slide into another profound minimum, or if cycle #25 will occur at all. This will also impact the appearance of sunspots and aurorae for the year to come. Asteroid occultations: events with a 99% probability of occulting of stars brighter than +8th magnitude. 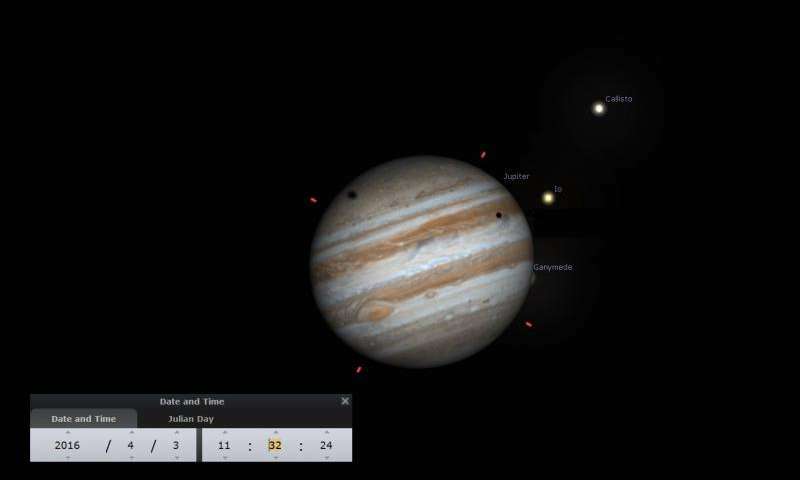 Double shadow transits: events involving the Jovian moons farther than 10 degrees from the Sun. Known comets expected to break +10 magnitude brightness and visible in binoculars. Remember though, the next 'great comet' could still show up at any time! 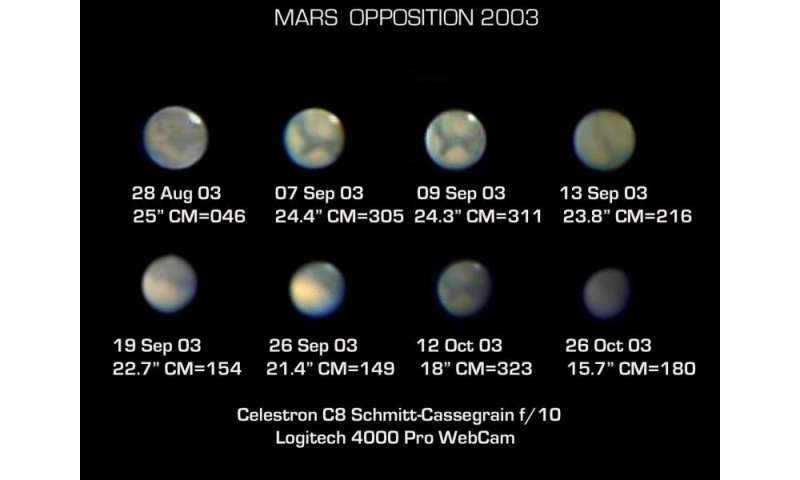 Conjunctions of naked eye planets passing closer than one degree apart. Occultations involving the Moon and naked eye planets, or the 'bright four' stars along the Moon's path (Aldebaran, Spica, Regulus or Antares). There are 4 eclipses in 2016 – two lunar and two solar—the minimum that can occur in a calendar year. There are no total lunar eclipses in 2016, just two faint penumbrals. Weirdness: Yes, Moons super, mini, black & blue are more are included. These are more of a modern cultural phenomenon than a true astronomical event, sure, but the public loves 'em, and we continue to include 'em. 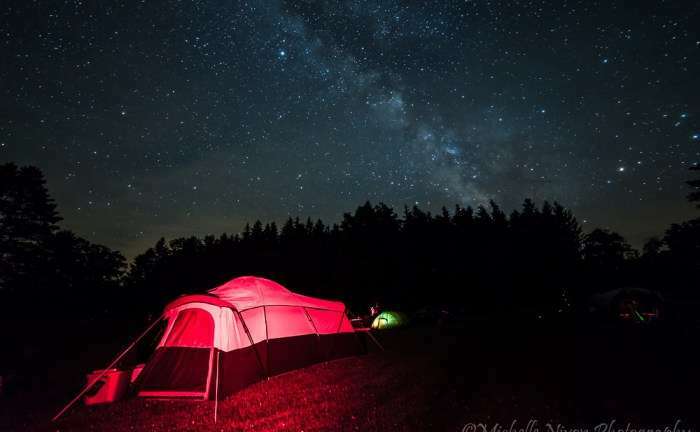 Meteor showers: annual showers with an expected zenithal hourly rate of 10 or higher. Times are quoted in Universal Time (UT being approximately equal to UTC/Zulu and GMT) with a 24 hour clock, and we've occasionally quoted EST-centric Eastern Standard/Daylight Time as needed. 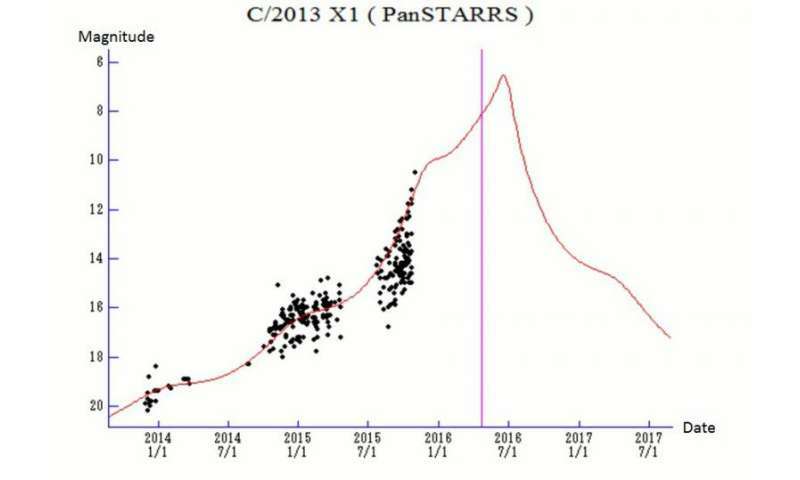 1- Comet C/2013 X1 PanSTARRS may break binocular brightness at +10th magnitude. 4- The Quadrantid meteors peak at ~8:00UT/3:00 AM EST, with an estimated ZHR of 120 favoring North America. 9- Venus passes 15' from Saturn at 4:00 UT/11:00 PM EST (on the 8th). 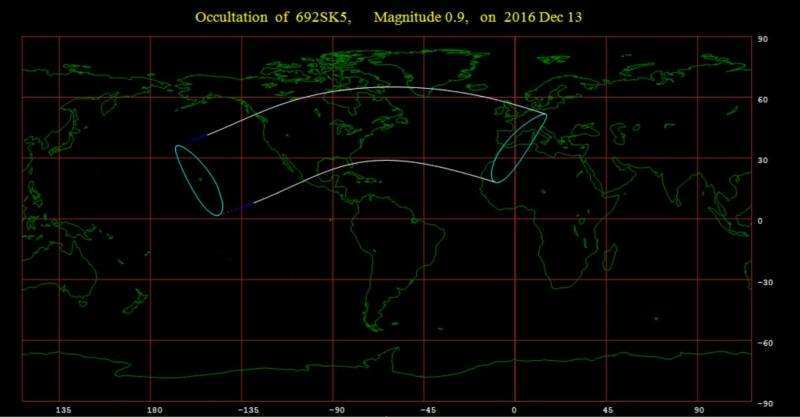 20- The 81% illuminated Moon occults Aldebaran at ~2:40UT/9:40 PM EST (on the 19th) for North America. 7- Mercury reaches 25.6 degrees western elongation at 5:00 UT/0:00 AM EST. 16- The 59% illuminated Moon occults Aldebaran at 8:05 UT/3:05 AM EST for the northern Pacific. 22- Double shadow transit (Io-Europa) occurs from 20:43-20:46 UT. 26- Double shadow transit (Io-Europa) occurs from 9:39-10:01 UT. 29- Double shadow transit (Io-Europa) occurs from 22:34-23:20 UT. 04- Double shadow transit (Io-Europa) occurs from 11:32-12:38 UT. 08- Double shadow transit (Io-Europa) occurs from 00:28-01:56 UT. 08- Jupiter reaches opposition at 10:00 UT/5:00 AM EST. 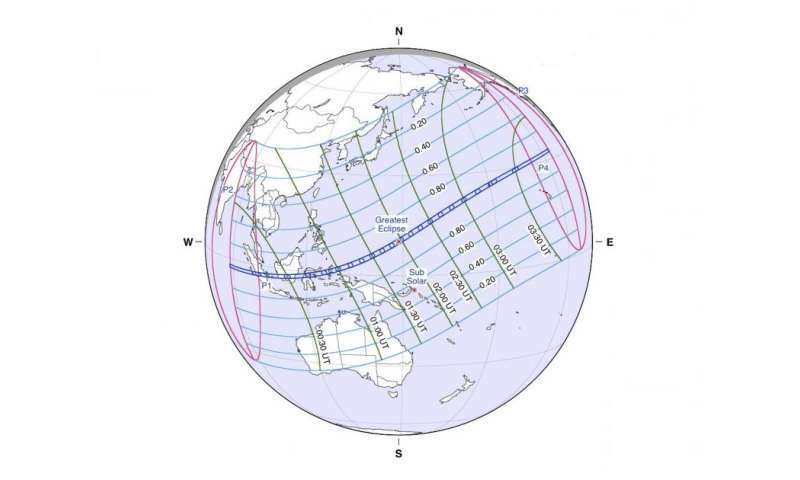 09- A total solar eclipse spans the Pacific and SE Asia centered on 1:58 UT. The only total solar eclipse of 2016, and the final one until the 2017 total solar eclipse spanning the United States. 09- Double shadow transit (Io-Ganymede) occurs from 18:56-19:11 UT. 11- Double shadow transit (Io-Europa) occurs from 13:24-15:15 UT. 14- The 37% illuminated Moon occults Aldebaran at 14:07 UT/10:07 AM EDT for Central Asia. 15- Double shadow transit (Io-Europa) occurs from 2:21-4:34 UT. 16- Double shadow transit (Io-Ganymede) occurs from 20:51-23:05 UT. 18- Double shadow transit (Io-Europa) occurs from 15:19-17:50 UT. 20- The March northward equinox occurs at 4:30 UT, marking GEO satellite flare and eclipse season. 22- Double shadow transit (Io-Europa) occurs from 4:23-7:10 UT. 23- Double shadow transit (Io-Ganymede) occurs from 23:47-0:58 UT (on the 24th). 23- A penumbral lunar eclipse occurs, centered on the central Pacific around 11:48 UT. 25- Double shadow transit (Io-Europa) occurs from 17:41-19:26 UT. 29- Double shadow transit (Io-Europa) occurs from 7:00-8:24 UT. 01- Double shadow transit (Io-Europa) occurs from 20:16-21:19 UT. 03- Double shadow transit (Io-Callisto) occurs from 15:09-15:49 UT. 05- Double shadow transit (Io-Europa) occurs from 9:36-10:17 UT. 06- The 1% illuminated Moon occults Venus for Europe in the daytime at ~8:31 UT. 08- Double shadow transit (Io-Europa) occurs from 22:54-23:14 UT. 10- The 17% illuminated Moon occults Aldebaran at 22:27 UT/6:27 PM EDT for eastern North America. 12- Double shadow transit (Io-Europa) occurs from 12:11-12:14 UT. 18- Mercury reaches 19.9 degrees eastern elongation at 12:00 UT/8:00 AM EDT. 21- Minimoon: the most distant Full Moon of the year occurs, reaching apogee 406,350 kilometers from Earth 13 hours after Full. 05- The Eta Aquariid meteors peak at ~20:00 UT/4:00 PM EDT with an estimated ZHR of 40 favoring SE Asia. 07- Double shadow transit (Io-Callisto) occurs from 4:38-5:44 UT. 08- The 6% illuminated Moon occults Aldebaran at 8:43 UT/4:43 AM EDT for NE Asia. 09- A transit of Mercury across the face of the Sun occurs, 7 hours and 23 minutes in central duration centered on ~14:57 UT for viewers around the Atlantic Ocean region. 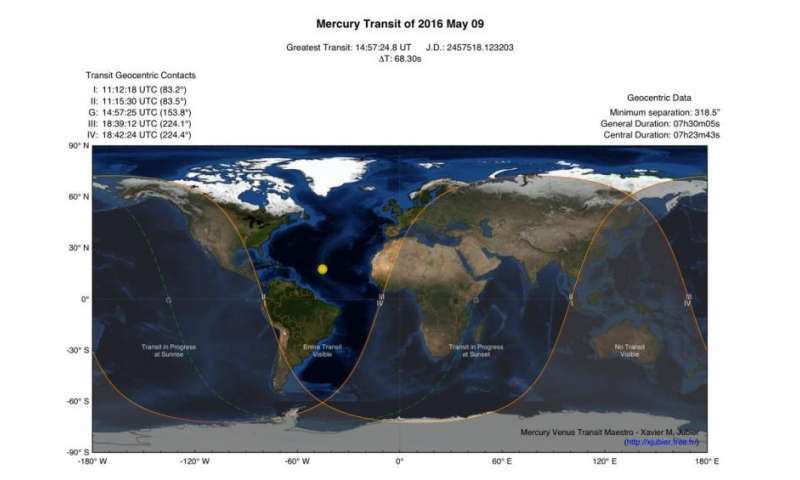 The only transit of the planet Mercury for this decade. 21- A Blue Moon occurs, in the sense of the 3rd in an astronomical season with four Full Moons. 22- Mars reaches opposition at 11:00 UT/7:00 AM EDT. 03- The 4% illuminated Moon occults Mercury ~9:47 UT for the Falkland Islands. 03- Saturn reaches opposition at 6:00 UT/2:00 AM EDT. 05- Mercury reaches 24.2 degrees western elongation at 10:00 UT/5:00 AM EDT. 20- The June northward solstice occurs at 22:34 UT. The International Space Station generally reaches a period of full illumination favoring the northern hemisphere around this time. 01- Comet C/2013 X1 PanSTARRS may reach a maximum brightness of +6th magnitude. 02- The 5% illuminated Moon occults Aldebaran for north Africa at 4:20 UT. 09- The 27% illuminated Moon occults the planet Jupiter for the southern Indian Ocean at ~10:11 UT. 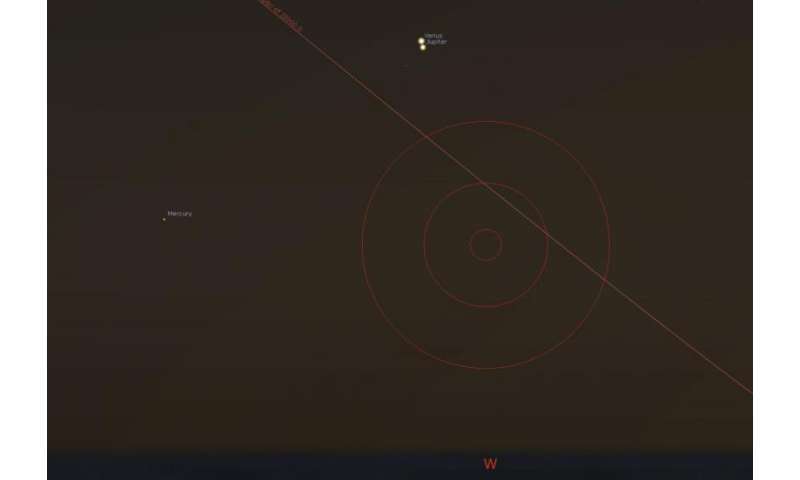 16- Mercury passes 30' from Venus at 23:00 UT/7:00 PM EDT. 27- The farthest lunar perigee of 2016 occurs 11:26 UT/7:26 AM EDT, at 369,658 km distant. 29- The 22% illuminated Moon occults Aldebaran for Central America at ~11:16 UT. 30- Mercury passes 17' from Regulus at 19:00 UT/3:00 PM EDT. 04- The 3% illuminated Moon occults Mercury for South America at ~22:11 UT. 06- The 14% illuminated Moon occults the planet Jupiter for the southern Pacific at ~3:30 UT. 06- Asteroid 120 Lachesis occults a +7.1 magnitude star for New Guiana and Eastern Australia at ~14:23 UT. 07- Double shadow transit (Io-Ganymede) occurs from 5:31-6:31 UT. 10- Closest lunar apogee of 2016 occurs at 00:06 UT, at 404,265 km distant. 12- The Perseid meteors peak at 15:30 UT/11:30 AM EST, with an estimated ZHR of 150, favoring the central Pacific. 14- Double shadow transit (Io-Ganymede) occurs from 7:30-9:38 UT. 16- Mercury reaches 27.4 degrees eastern elongation at 18:00 UT/2:00 PM EDT. 20- Asteroid 164 Eva occults a +5.3 magnitude star for northeastern Brazil at 22:41 UT. 21- Double shadow transit (Io-Ganymede) occurs from 11:29-11:34 UT. 25- The 45% illuminated Moon occults Aldebaran for the western Pacific at ~16:44 UT. 27- Asteroid 85 Io occults a +7.5 magnitude star for North America at 4:38 UT. 27- Venus passes 4' from Jupiter at 22:00 UT/6:00 PM EDT. 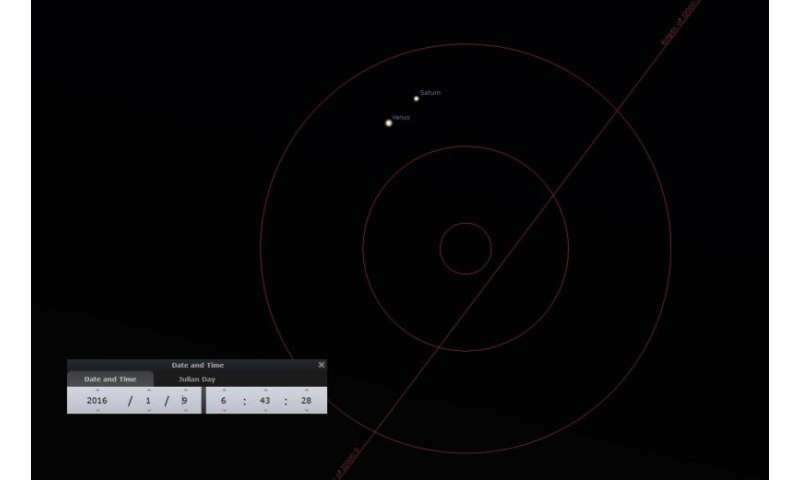 The closest conjunction of two naked eye planets for 2016. 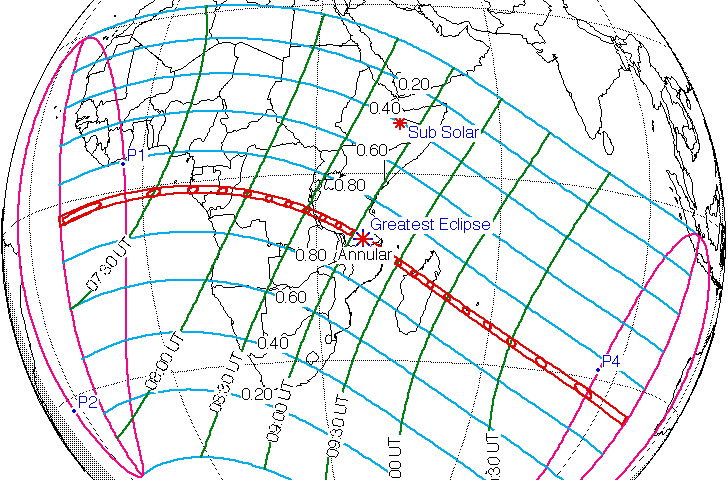 01- An annular solar eclipse spans southern Africa and the Indian Ocean, centered on ~9:08 UT. 01- The final Callisto shadow transit of the current cycle occurs at ~10:30 UT. 02- The 1% illuminated Moon occults Jupiter for Central America at ~21:55 UT. 02- Neptune reaches opposition at 16:00 UT/2:00 PM EDT. 03- Asteroid 51 Nemausa occults a +7.6 magnitude star for western United States at ~10:02 UT. 03- The 5% illuminated Moon occults the planet Venus for the Arctic at ~10:31 UT. 16- A penumbral lunar eclipse occurs, centered on the Indian Ocean around ~18:55 UT. 21- The 70% illuminated Moon occults the star Aldebaran for southwestern Asia at ~22:37 UT. 22- The September equinox occurs at 14:21 UT, also marking GEO satellite flare and eclipse season. 29- Mercury reaches 17.9 degrees western elongation at ~1:00 UT/9:00 PM EDT (on the 28th). 29- The 2% illuminated Moon occults the planet Mercury at ~10:41 UT for South America. 30- The 1% illuminated Moon occults the planet Jupiter for Canada at 16:11 UT. 11- Mercury passes 51' from Jupiter at ~9:00 UT/5:00 AM EDT. 12- Asteroid 9 Metis occults a +7.4 magnitude star for Europe at ~1:37 UT. 13- Asteroid 268 Adorea occults the bright +1.4 magnitude naked eye star Regulus for New Guiana at ~18:04 UT. The brightest star occulted by an asteroid in 2016. 15- Uranus reaches opposition at 10:00 UT/5:00 AM EDT. 16- Asteroid 7 Iris occults a +6.3 magnitude star for southern South America at 00:24 UT. 16- Supermoon 1 of 3 occurs at 23:37 UT, reaching perigee 19 hours after Full. 17- Double shadow transit (Ganymede-Europa) occurs at 20:59-22:11 UT. 19- The 83% illuminated Moon occults the star Aldebaran for North America at ~6:40 UT. 22- The Orionid meteors peak at 2:00 UT (10:00 PM EDT on the night of the 21st) with an estimated ZHR = 25 favoring Europe and Africa. 24- Double shadow transit (Ganymede-Europa) occurs at 23:34-2:06 UT (on the 25th). 30- A 'Black Moon' occurs, in sense of the second New Moon in a calendar month. 31- The most distant lunar apogee of the year, at 19:30 UT and 406,659 km distant. 01- Double shadow transit (Ganymede-Europa) occurs at 3:20-4:39 UT. 08- Double shadow transit (Ganymede-Europa) occurs at 7:11-7:19 UT. 14- Supermoon 2 of 3 (Closest Full Moon of the Year) occurs, also the closest lunar perigee of 2016 at 356,511 km distant at 11:24 UT, occurring 2 hours before Full. The closest lunar perigee spanning a period from 1990-2020. 15- The 98% illuminated Moon occults the star Aldebaran for central Asia at ~17:12 UT. 11- Mercury reaches 20.8 degrees eastern elongation at 4:00 UT (11:00 PM EST on the 10th). 12- Supermoon 3 of 3 occurs at 23:28 UT, with perigee occurring 24 hours prior to Full phase. 13- The 99% illuminated Moon occults Aldebaran for North America at ~4:37 UT. 13-The Geminid meteors peak at 24:00 UT/7:00 PM EDT with an estimated ZHR of 120 favoring central Asia. 14- Asteroid 11 Parthenope occults a +7.4 magnitude star for South America at ~1:05 UT. 14- The Moon reaches its farthest northern declination for 2016 at 18.9 degrees around 21:00 UT. 18- The Moon occults the bright star Regulus ~18:38 UT for southern Australia, marking the first occultation of Regulus in a new cycle running through early 2018. 21- The December southward Solstice occurs at 10:44 UT. The International Space Station reaches a span of full illumination favoring the southern hemisphere around this time. 29- The Moon reaches its farthest southern declination for 2016, at -19.0 degrees around 02:00 UT.